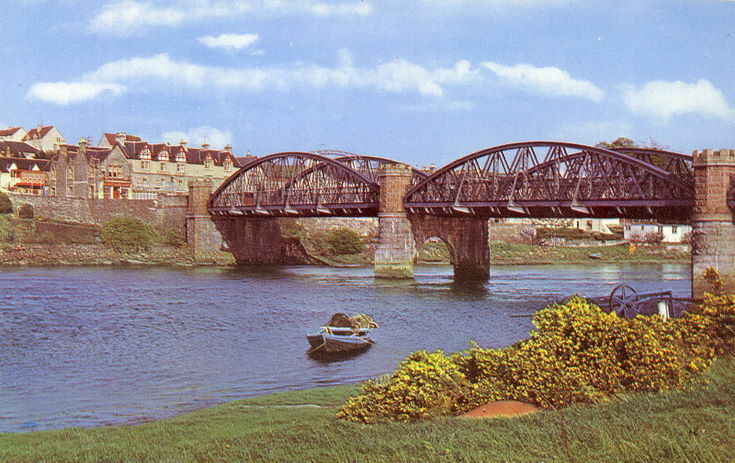 Colour postcard of the three span bridge at Bonar Bridge. This was the bridge that replaced the original Telford bridge, built 1811/12 destroyed in a storm 19 January 1892. From an album containing a selection of postcards and photographs taken by Mrs J.I.C. Mackayo f Dornoch and surrounding area. Many thanks for your comment. Our understanding was that the bridge was destroyed by a flood (assumed to have followed a storm) in February 1892 which lifted the bridge from its foundations and into the Firth. The second bridge (in postcard above) was finished in July 1893 and was itself replaced in 1973 with the current Bonar Bridge which has a much greater weight capacity. I've always been told that the original bridge was destroyed by the weight of ice piling up against the pillars, but I can't give you any written evidence. A plaque which was originally placed on the second Bonar Bridge when it opened in 1893, and which now stands beside the third bridge, states "Bonar Bridge. Destroyed by a flood on 29th January 1892. Rebuilt by the County Councils of Ross & Cromarty and Sutherland 1893. Opened 6th July 1893." This near contemporaneous record is compelling evidence that flood water was the cause of the 1812 bridge’s destruction. It has been suggested elsewhere that the bridge "disappeared" after an accident with a fishing vessel. According to the RCAHMS website, the bridge survived impacts by fir trunks and a ship, but collapsed when it was undermined by flood water. This latter version fits in with the 1893 plaque’s description, and may also suggest the genesis of the alternative (and probably inaccurate) story that the bridge was destroyed by a ship. "Your Lordships may be aware—certainly those of your Lordships who are connected with Scotland will be aware—that in the last week of January a very disastrous flood took place over a great part of the North of Scotland by which a very large number of bridges on the roads in the counties of Inverness, Ross, Cromarty, and Sutherland were washed away—one in particular, the destruction of which has caused a very great amount of public inconvenience, was Bonar Bridge, which is very well known to your Lordships, as the main line of communication between the counties of Ross and Sutherland."